This column by Edward R. Carr is part of Global Policy’s e-book, ‘The Donors’ Dilemma: Emergence, Convergence and the Future of Aid’, edited by Andy Sumner. Contributions from academics and practitioners will be serialised on Global Policy until the e-book’s release in the first quarter of 2014. Find out more here or join the debate on Twitter #GPfutureofaid. Long a focus of development aid, agricultural development and food security are poised to remain a significant part of aid investment going forward. After all, by 2050 the world will be home to more than nine billion people, all of who will need to eat. Many of these people will be wealthier than they are now, and generally speaking those who are wealthier eat more, and eat different foods (i.e. more protein) than those who are not. At the same time, the impacts of climate change on temperature and precipitation are expected to have a net negative impact on global food production, though there is significant debate about the magnitude of this impact. It appears we are hurtling toward a global crisis that will arrive within a generation. In contemporary aid policy and programming, the response to this apparent crisis is a broad effort to boost agricultural production in a “climate smart” manner. Climate smart is a broad heading that takes on everything from the increased development and cultivation of genetically-modified crops, to the reworking of markets and agricultural systems to focus on those crops most suited to the present and likely future climate, to the adoption of farm-scale practices and technologies that improve soil moisture levels. While diverse, these programs share a focus on the transformation of agriculture practice and agricultural markets in the poorest parts of the world to radically boost production and therefore food availability. Unfortunately, they often also share minimal, if any, interest in understanding existing agricultural systems and markets on the terms of those who occupy them. These systems are at best illegible and therefore viewed as illogical, and at worst seen as barriers to the solutions we need for a climate smart agricultural future. The fundamental logic of the crisis narrative that enables this sort of behavior is problematic, at best. Today we produce twice the calories needed to feed the global population annually. And, incredibly, we lose something on the order of 25% of that production to waste, whether in spoilage between the farm gate and markets of the Global South (where rates of loss can exceed an astonishing 40%), or in uneaten food that is disposed of in the Global North. In short, the looming crisis is perhaps much further off than we might believe. We are not at a triage point, where radical action must be taken, and caution thrown to the wind as we search for a way out of the latest Malthusian crisis. Yet in ignoring existing systems and their logic in the name of addressing a crisis that has not yet arrived, development aid runs a significant risk of undermining the nascent turn toward addressing vulnerability, and building resilience, in the policy and implementation world by unnecessarily increasing the vulnerability of the poorest populations. There are, without question, places where markets could be greatly improved, and where agricultural knowledge gleaned from research and practice in other parts of the world might be applied to the improvement of local agricultural outcomes. But this is not the same thing as saying that existing practices and knowledge are without value and in need of replacement. By failing to understand existing agricultural practices as time-tested parts of complex structures of risk management that include concerns for climate variability, we overestimate the current vulnerability of many agricultural systems to the impacts of climate change, and underestimate the risks we create when we wipe these systems away in favor of “more efficient”, more productive systems meant to address this looming global food crisis. In my work on rural livelihoods systems in sub-Saharan Africa, first in Ghana, and more recently in Malawi, Mali, Senegal, and Zambia, I have found in each setting that livelihoods strategies are massively overbuilt for the worst-case scenario for any number of shocks, ranging from climate variability to market variability. These systems are not only predicated on the production of food and income, but also the management of these risks in contexts where the state or other actors cannot or will not provide the safety nets necessary to make such management unnecessary. The logic of these systems, when these wider goals are considered, often becomes obvious. In my book Delivering Development: Globalization’s Shoreline and the Road to a Sustainable Future, I documented one such community-scale livelihoods system in coastal Ghana, from its inception in the 1820s to the present. 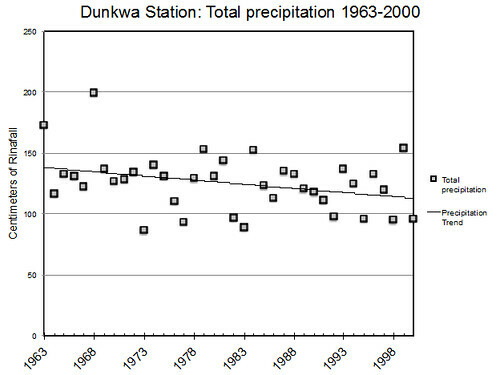 Since 1963 (and likely before that), the residents of the neighboring villages of Dominase and Ponkrum have been experiencing a long-term decline in their annual precipitation. 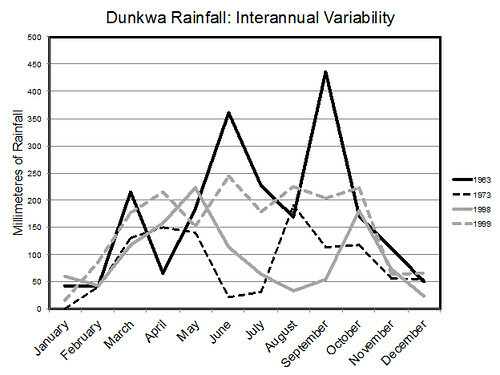 Figure 1 below illustrates this trend through the rainfall data collected at Dunkwa, a weather station some 40km from the villages but the only one in continuous operation throughout this period (though this station is broadly representative of the trend in this part of coastal West Africa that, according to my colleagues at Columbia University’s International Research Institute for Climate and Society, continues to this day and is confirmed by satellite measurements). At first glance, this graph presents an ominous picture, as annual precipitation levels have declined such that, on average, there is no longer enough annual precipitation to reliably produce cocoa, formerly an important cash crop for some of the residents. But a more careful look at the graph shows something more interesting. Looking beyond the trend line, there are complex things happening inside these annual figures. While there is indeed a downward trend that continues to this day, there have already been several years (1973, 1977, 1982, 1983, 1995, 1998, 2000) where the total precipitation was much lower than the current average precipitation, or the likely annual precipitation for the next few decades. This means is that the farmers in Dominase and Ponkrum, like so many around the world, have already fed the future – that is, they have already farmed through at least one, if not several, seasons like those we expect to become the norm some decades in the future (Figure 2). These farmers survived those seasons, and learned from them, adjusting their expectations and strategies to account for the possibility of recurrence. As I describe in detail in Delivering Development, they disaggregate their farms by planting in less-than-ideal, but precipitation-hedged situations like the tops and bottoms of hills. This system works. In 1998, when the monsoon failed and the major rainy season collapsed after a relatively normal start (Figure 3), this hedging resulted in enough food to feed the community and prevent disaster until the recovery of the minor rainy season four months later. These farmers are far from helpless in the face of climate change impacts. They are already capable of feeding themselves in a future marked by climate change. Figure 2: An example of the variable patterns of rainfall between years of unusually heavy rain and unusually light rainfall. 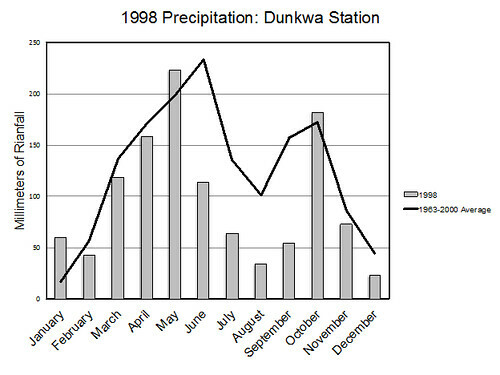 This graph highlights 1998 and 1999 to show the wide variation in year-to-year precipitation that farmers in Dominase and Ponkrum have to manage. Figure 3: The 1998 season, illustrated as a departure from historical averages. Note the normal start to the season, followed by a sudden collapse during June and July, normally months of heavy rainfall. I do not want to over-valorize this or any other livelihoods system with which I am familiar when it comes to the management of climate change impacts. While the system in Dominase and Ponkrum prevented disaster, the hedges built into the system are likely over-compensating for the likelihood of this crisis’ recurrence (under-compensation also occurs, but is much less common because the cost of failure is so high in this and similar contexts). Further, the year-to-year hedging of farms against climate variability can be a costly practice – the likely “insurance premium” of lost production in a good year eats up somewhere between 10% and 20% of total potential production. While these management strategies are not ideal, they do reflect local capacities to adjust and account for extreme conditions, the extreme rainfall or drought events out along the tails of historical distributions whose unpredictable recurrences characterize a changing climate regime. It is here, at the edges of local or indigenous knowledge, that development aid can make a significant difference. By helping to catalyze the development of safety nets that make expensive hedging unnecessary, development aid can reduce the number of risks against which these farmers must hedge with their livelihoods. With less labor and income given over to hedging, individuals and households will have more income and food on their hands. The consequences of even a few extra dollars worth of production can be significant. In Ghana, I found that women could multiply any agricultural income beyond subsistence such that every dollar of additional agricultural income also yielded a dollar of additional nonfarm income. These women did not need to be told how to invest their income. They had clearly been waiting for the chance. This logic applies to the likely future of aid aimed at food security in a changing climate in other environments and contexts. For example, farmers in southern Mali use local indicators, such as the flowering of a particular tree or the emergence of a particular insect, as indicators that help them time various activities in their agricultural cycle. Many trust their local indicators more than the seasonal and short-term forecasts they currently receive, perhaps with some reason – their indicators actually seem to work and the forecasts are not yet as accurate as anyone would like. But these indicators work under current climate regimes, and these regimes are changing. At some point, the tree will start to flower at a different, perhaps less appropriate time, or simply cease to flower. The insect will emerge at a different time, or perhaps be driven away by the emergence of new predators that can now move into the area. If the climate continues to change, local indicators will eventually fail. Again, this is where aid becomes critical – not in the fundamental reworking of existing systems (a fairly high risk enterprise too often undertaken in a manner that eliminates local risk-management tools), but in the strategic, evidence-based application of technical expertise to build upon the capacities that already exist at the farm, household, and community level in the Global South, addressing existing or likely future knowledge gaps at the local, state, and regional scales. Considering these points, I suggest that the future of “climate smart” aid lies not in reengineering entire agroecological systems and their associated economies (a fairly high risk enterprise), but in building upon local, indigenous capacities that already exist. Farmers in the Global South have already fed the future. Perhaps they did not do it all that well, and all they managed was to stave off catastrophe. But given the absence of safety nets in most places in the Global South and the limited access so many farmers have to inputs and irrigation, avoiding catastrophe is an accomplishment that warrants study and serious consideration. We should be building on local capacity, not succumbing to crisis narratives that suggest that these farmers have little capacity, either to manage their current environment or to change with the environment. 1) Beware crisis narratives about food security in a changing climate. While there is little doubt that meeting the needs of a growing population under climate change will present challenges, most current narratives are constructed at global scales with problematic assumptions about future production, pricing, and patterns of consumption, and bear little on local situations. However these narratives serve as effective justifications for the radical reworking of household and community agricultural and livelihoods practices that often increase risk for the poorest and most vulnerable. 2) A future under climate change is not a great unknown for farmers in the Global South. Most farmers have already managed several seasons as difficult, or more difficult, than what we project to be normal in the next few decades. Arguing that these farmers are facing a catastrophe they cannot see coming enables policies and programs aimed at reworking existing agro-ecologies and livelihoods. However, this argument fails to grasp the ways in which these past seasons inform existing indigenous planning and risk management, making it difficult to assess the actual levels of agricultural/livelihoods vulnerability to the impacts of climate change in particular places. 3) Food security programming should be able to identify the difference between an inefficiency and a critical part of a community- or household-level safety net. Long-standing narratives of inefficient and illogical allocations of resources within households and communities provide justifications for reworking agricultural and livelihoods systems. While the efficient allocation of resources in agricultural production and livelihoods strategies is a worthy goal, aid dollars are generally put to work in places where there are limited safety nets or state capacity. In such settings, individuals, households, and communities are responsible for their own safety, a goal they build into their practices alongside the food production and income generation. If we ignore this need, we risk increasing the vulnerability of those with whom we work. 4) Development aid’s opportunities lie in strategic, evidence-based application of technical expertise to build upon the capacities that already exist at the farm, household, and community level in the Global South, addressing existing or likely future knowledge gaps at the local, state, and regional scales. Whether aid’s interventions lie in catalyzing the development of appropriate safety nets or in producing tools like accurate seasonal forecasts, aid’s comparative advantage lies in the ability to reduce the risks that so many in the global south manage at the expense of opportunities to innovate in locally-appropriate manners. In the end, such innovation has been, and remains, the principle generator of change in the Global South. Dr. Edward R. Carr is the director of the Humanitarian Response and Development Lab and an associate professor in the Department of Geography at the University of South Carolina.